Three years after nearly 200 countries signed a landmark climate agreement in Paris, they are still far off-track from preventing severe global warming in the decades ahead. This month, diplomats from around the world are gathering in Katowice, Poland, to discuss stepping up their efforts. It’s an enormous challenge. Under the Paris deal, every nation volunteered a plan to curtail its greenhouse gas emissions between then and 2030. But many large emitters aren’t even on track to meet their self-imposed targets, according to new data from Climate Action Tracker. What’s more, even if every country did manage to fulfil its individual pledge, the world would still be on pace to heat up well in excess of 2 degrees Celsius (3.6 degrees Fahrenheit) over preindustrial levels, the threshold that world leaders vowed to stay “well below” in Paris because they deemed it unacceptably risky. Right now, current pledges put the world on pace for around 3 degrees Celsius of warming. To reach the broader Paris goals, countries would have to dramatically accelerate the transition toward clean energy over the next 12 years. But, with global emissions on pace to rise sharply this year, time is running short. Under the Paris Agreement, former President Barack Obama pledged to slash United States emissions 26 to 28 percent below 2005 levels by 2025. That was already a tough task: While pollution from the country’s power plants is falling rapidly as utilities retire coal plants in favor of cleaner natural gas and renewables, sectors like transportation and heavy industry have proven harder to clean up. But President Trump has disavowed the Paris agreement altogether and is now moving to dismantle Obama-era climate regulations like efficiency standards for cars and light trucks. And while some states, including New York and California, are pursuing their own policies on renewable energy and electric vehicles, they may not prove sufficient to close the gap. For now, analysts say the United States will fall well short of its Paris pledge. That, in turn, could make it harder for future administrations to pursue the even deeper emissions cuts by midcentury that are needed to help keep the world well below 2 degrees of global warming. Although the European Union is currently on pace to fall slightly short of its promise to cut emissions 40 percent by 2030, compared with 1990 levels, that may soon change. In June, European officials agreed on more ambitious new measures for renewable power and energy efficiency which, if implemented, would help the union meet its overall emissions targets, according to Climate Action Tracker. And officials are now debating whether to revise their 2030 pledge and pursue even deeper emissions cuts. Still, there are plenty of obstacles: While countries like Britain and the Netherlands have vowed to phase out the use of coal power, Poland is currently building new coal plants. And the Continent as a whole has been slower to curb pollution from cars and trucks. Experts say China submitted a Paris pledge that was relatively easy to meet: overall emissions would peak around 2030 and the country would get 20 percent of its energy from non-fossil sources. The country appears to be on track to hit that target. Analysts now expect China’s once-insatiable demand for coal to level off by the mid-2020s, and the government is investing heavily in cleaner sources like solar, wind and nuclear. China also now sells more electric cars and buses than the rest of the world combined. But the analysts at Climate Action Tracker rated China’s existing pledge as “highly insufficient” and suggested that the country would have to step up its efforts considerably to help keep the world well below 2 degrees of warming. The country’s coal emissions, for instance, would most likely need to decline significantly by 2030 rather than simply flatten out. India, which has long held that wealthier countries should take the lead on cutting emissions, has a less restrictive Paris pledge than Europe or the United States. The country vowed to install more clean energy and improve its carbon intensity, the amount of carbon dioxide emitted per unit of gross domestic product, while still allowing total emissions to rise through 2030. India’s emissions per person emissions would most likely still be lower than America’s or China’s. Based on recent trends, it now looks plausible that India could surpass those goals as the falling cost of solar power and shifting market conditions have allowed the country to scale back plans for new coal plants. But the country’s emissions trajectory remains uncertain and the Indian government has asked for financial assistance from other countries to help ratchet up its climate efforts. Brazil and Indonesia are the world’s seventh- and eighth-largest emitters of greenhouse gases, in large part because farmers in those countries continue to burn and clear away carbon-rich rain forests and peatlands for agriculture. The two countries had vowed to better protect their forests as part of their Paris pledges, but both are now struggling to do so. In Brazil, deforestation rates have increased since 2012 after years of decline. And President-elect Jair Bolsanaro, who takes office in January, has vowed to roll back safeguards in the Amazon rain forest in order to promote ranching and logging. Indonesia has struggled to constrain the palm oil and paper plantations that are encroaching on its forests and peatlands. And the government has announced plans to double coal-fired power by 2025, which would further increase emissions. Negotiators are meeting in Katowice now to discuss guidelines for making national pledges and policies more detailed and transparent, so that outsiders can gauge individual countries’ progress (or lack thereof) more precisely. Many of the Paris pledges remain fairly opaque, and nations are often vague on what specific policies they will take to meet them. There is still no official mechanism for quantifying progress. As a result, groups like Climate Action Tracker have had to make rough estimates as to whether countries are on pace to meet their pledges and how much further each country would need to go for the world to stay well below 2 degrees of global warming. Increasing the transparency of pledges could make it easier for countries to pressure each other do more, but, ultimately, it will be up to national and local governments to decide to take stronger action. World leaders have informally agreed to consider strengthening their existing pledges before another round of talks in 2020, but it is still unclear how much they intend to do. The Katowice talks “will be in many ways the opening bell on that sprint toward 2020,” said Nathan Hultman, director of the Center for Global Sustainability at the University of Maryland and a senior fellow at the Brookings Institution. Notes: Charts show the carbon dioxide equivalent of greenhouse gas emissions. Chart data is based on Climate Action Tracker’s December 2018 update. The group will make global data public next week. Climate Action Tracker’s analysis is based on emissions reported to the United Nations by each country. The global data accounts for greenhouse gas emissions and sinks from land-use and forestry, but individual country data does not include land-use and forestry adjustments because of uncertainty in accounting. For each country, required emissions reductions for the Paris and 2°C scenarios are drawn directly from the latest available year of historical data to the final projected year under Paris agreement goals (2025 for the United States, and 2030 for other countries). The global two-degree scenario reflects a greater than 66 percent chance of limiting warming to 2 degrees Celsius by 2100. For individual countries, the two-degree range is defined by Climate Action Tracker based on a “Fair Share” calculation. India has made several pledges under the Paris Agreement. 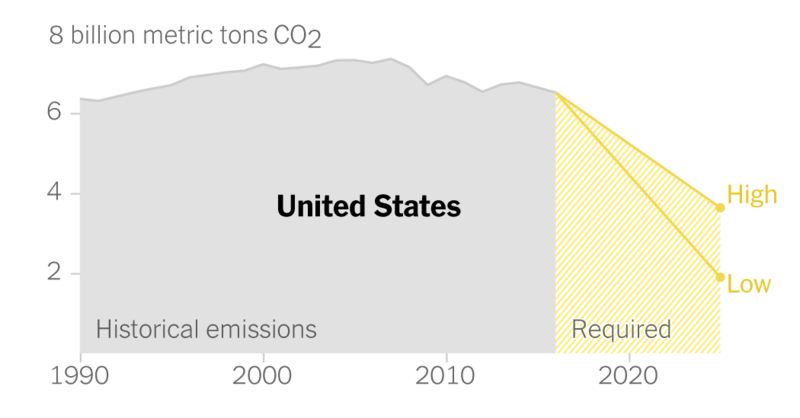 The chart above reflects the goal of lowering emissions intensity of G.D.P. by 33 to 35 percent below 2005 levels by 2030.